Jive Web moves your business communications to your web browser. This softphone allows you to monitor your contacts’ availability, place web-based calls, send SMS text messages, chat, and manage your directory—all without touching a traditional deskphone. Additionally, Jive Web allows you to manage your voicemail settings, build your personal dial plan (Find/Me Follow Me), launch GoToMeeting, and set up fax-to-email in real time. Before you can use Jive Web, you must have a registered JiveID and at least one device assigned to you by a system admin. 2. Enter your Email Address (JiveID) and Password. Tip: We have many single sign-on options. To learn more, click here. Opens the keypad and contact directory to make a call. Opens a new SMS text or chat message. Launches GoToMeeting. Icon is only visible to users with a GoToMeeting license. Click to open the app switcher. Opens the online billing and payments. Opens GoToMeeting. Icon is only visible to users with a GoToMeeting license. Click to view Jive Web options and settings. Displays settings for Jive Web and your line. Silences the ringer for incoming calls and messages. Sends feedback (bugs and feature requests) to Jive. Signs out of Jive Web. Provides access to your call log, SMS text/chat messages, and voicemails. Blue icons appear when there is new activity. Displays the most recent contacts with call activity. Displays all your favorite contacts. To add a contact to your favorites, click the star icon in their contact card. Allows you to visually monitor your contacts to know whether or not they are on an active call. Defines which line and device is used to make/receive calls. This does not affect SMS text or chat messages. Closes the keypad and contact directory. Toggles between the keypad and contact directory. Adds a new contact to the directory. Initiates a voice call with the entered contact. Rejects the incoming call and sends it to the next step in your find me/follow me settings. Direct Transfer = Routes a call to another party without speaking to them first. Warm Transfer = Allows you to speak with the other party before transferring the call to them. Send to Voicemail = Transfers the call directly to a voicemail box on your system. Places the call on hold. Places the current call on hold and adds another call to the current call (three-way call). Modifies the audio settings for the current call only. Adds the contact to your favorites. Edits or deletes a contact. Note: Only contacts you have added can be edited or deleted. Sends a new SMS text or chat message. Tip: Type a new message and then press ENTER on your keyboard to send a new message. Opens the contact details and activity. Marks all activity as seen. Marks the voicemail message as played. Defines the ringtone type and volume for incoming calls. Defines the ringtone for incoming SMS texts and chats. These settings can be overridden on a per call basis. Defines the default microphone used for calls. Defines the default speaker used for calls. Changes the language of Jive Web. Displays 3rd party apps that integrate with Jive Web. Select an app to login and allow Jive Web to access your account. This integration is in BETA. Jive’s Zoho CRM integration unites your communications with your CRM (customer relationship management). Each time you make or receive calls, Jive Web automatically looks for any customers that match the caller ID. Calls are automatically logged and options to edit your customer accounts or add call notes are readily available. Click a phone number within Zoho CRM to initiate a call directly to your phone. Jive’s Zoho Desk integration unites your communications with your Desk service application. Each time you make or receive calls, Zoho Desk automatically looks for any customers that match the caller ID. Calls are automatically logged and options to edit your customer accounts or add call notes are readily available. Click a phone number within Zoho Desk to initiate a call directly to your phone. Displays all the lines and devices that have been assigned to you. Each of these are options within the line selector. Extension assigned to the device. Untested = Device connection has not been verified. Success = Device is connected. Call rejected or failed = Device failed to connect. Sends a test call to the device and extension to verify connectivity. Deletes the device from Jive Web. Most phones have one or more buttons (or sidecars) that you can customize to perform specific functions, like speed dial. These settings allow you to personalize your buttons to how you communicate best. Note: You must click [SAVE & SYNC] or manually power cycle the device to apply any changes made to its settings. In order to customize buttons on your phone, editing permissions must be enabled by a system admin on your device profile. If you have multiple phones assigned to you, select which device you would like to customize. Line = Adds a line extension to the button. The first button on your phone is always a line assigned to your personal extension. Speed Dial = Adds an extension to the button for speed dial. Monitored Extension = Adds an extension to the button for presence monitoring. On Phone Defined = Allows the phone to have functionality manually assigned to a button that cannot be overwritten. The button label that appears on your phone (optional). Note: The button label overrides the line name. Select the extension for assigned button type. Adds a new custom button. The amount of buttons available are dependent on the user’s phone model; see the phone’s user manual to learn more. Adds a sidecar for more button customization. Even though voicemail has been around a while, it’s still an integral part to the way we communicate. Unlike old school answering machines, you now have the ability to customize more than just the greeting before the beep. Set up email notifications to alert you every time a message is received, and even attach the recording so you can listen to it from anywhere. Plus, you can determine your playback/recording options and change your password all online. Enables email notifications when a voicemail is received. Attaches voicemail audio file to email notifications. WAV49 = Smaller file size (default, recommended). WAV = Larger file size, more compatible with mobile device. Deletes voicemail from Jive’s system after sending an email notification. WARNING: Checking this box will prevent voicemail management from your phone or Jive Web. Deletion is permanent; we cannot retrieve deleted messages. Allows the caller listen to their message and optionally re-record. Note: Enabling this setting does not automatically prompt callers to press # after recording their voicemail. You will need to include these instructions in your voicemail greeting. Allows a caller to press zero to be transferred to a specified extension, rather than leaving a message. Changes your voicemail password (default is 0000). Password must be at least four digits. Welcome to the new generation of fax machines, where everything is digital and trees are saved. A virtual fax machine allows you to send and receive faxes through email, which removes the need to have a physical fax machine and allows you to fax on the go. Additionally, you’ll no longer need a phone number dedicated only to faxing because your phone number will be able to receive calls and faxes. This section only demonstrates how to receive virtual faxes. If you would like to send virtual faxes, contact a system admin to make sure this feature is properly set up. This feature only works if a direct phone number is routed to your line. If you are only reachable through auto attendant options or a directory search, the system does not get a chance to first listen for a fax tone before sending a call through as a voice call. If you are not sure a direct phone number is routed to your line, contact a system admin for assistance. Sends virtual faxes to the email address of your choice. Incoming faxes will come from noreply@jive.com, so make sure this address is not marked as spam. When someone sends a fax to your phone number, it is first converted to a PDF and then emailed as an attachment. The incoming fax will come from noreply@jive.com, so make sure this address is not marked as spam. The Find Me/Follow Me settings will route your incoming calls in sequence to specified destinations to create a unique dial plan. When someone calls your line, you can have it simultaneously ring your cell phone; or if you don’t answer, you can direct the call to a completely different destination. No matter where you are or what you are doing, your calls will follow you the way you want them to. Note: There are scenarios when the Find Me/Follow Me settings are overridden on a per call basis by other dial plans on the system. Sends the caller to the specified extension or external phone number. Note: Your caller ID will be blocked if your system admin has enabled Block Caller ID on the phone number used by your line. When the extension is dialed, multiple extensions or external numbers ring all at once. For example, if you want two extensions and a cell phone to ring at the exact same time; add multiple extensions or numbers to a single ring step. The primary benefit of this feature is when a cell phone is in a ring step. When a cell phone is turned off or is out of range, calls usually go straight to the cell phone voicemail box. Without confirm pickup, the voicemail would answer the call and prematurely end the dial plan. Enabling confirm pickup allows the call to re-route back to the next ring step or to your Jive voicemail box. A secondary benefit is if calls are being routed to a personal phone number. Having confirm pickup enabled lets you know the call is business related, and you can then answer the call appropriately. This option controls what is shown on the caller ID for call steps with external numbers. If enabled, the caller ID of the original caller is displayed. Disabled, the caller ID shows the number set up for the line. Note: This feature does not work if your system admin has enabled Block Caller ID on the phone number used by your line. The time in seconds that the line should ring before going to the next step in the dial plan. Note: This may be overridden by dial plan settings set up by an admin. Creates multiple ring steps that occur in order. For example, if you want your desk phone to ring first, and you do not pick up, route the call to another extension before it finally dials your cell phone; create multiple ring steps within your dial plan. Defines what happens if the call is not answered during the previous ring steps. By default, calls are routed to the extension’s voicemail, but there are some additional options. Sends the caller to the voicemail box associated with the line. Sends the caller to the specified extension. Sends the caller to the specified external number. If the call was transferred to the line, returns the call to the party that initiated the transfer. If the call was not transferred to the line, it hangs up on the caller. Simply hangs up on the caller. Defines what happens if the call fails due to an internet outage or hardware issue. Follows the If no answer, send to… ring step. Forwards the call to a specified extension. Note: To avoid routing calls to another device that is also affected by the same internet outage, we recommend only using failover to an extension if you have multiple locations on the same system (i.e. an office in Chicago and in Dallas). Forwards the call to a specified external number. 1. Click the line selector at the bottom of the left sidebar. 2. Select the line and device to use for all calls. 1. Click Contacts in the left sidebar. 2. Search for a contact’s name, number, or extension. 3. Select a contact from the results and then click [GO] to view their contact details and activity. 4. Click from the contact window. Tip: Click the star icon again to remove the contact from your favorites. 2. Enter the contact’s phone number. 4. Enter the contact’s First Name and Last Name. Only contacts you have added can be edited. 4. Click and then select Edit Contact. 5. Make any necessary changes and then click [SAVE CHANGES]. Only contacts you have added can be deleted. 4. Click and then select Delete Contact. 1. Click Voicemail in the left sidebar. SMS is in PRIVATE BETA. Please email client@jive.com to request early access to this feature. After which, a system admin must enable SMS for your phone number. 4. At the bottom, type your new message and then press ENTER on your keyboard to send. Note: SMS/Chat messages cannot be deleted. 1. While on an active call, click transfer. 1. While on an active call, click add. 3. Select a contact and then click [CALL]. 2. When you hear a dial tone, enter the forwarding destination (internal extension or external number). Note: Your caller ID will be blocked, when forwarding to an external number, if your system admin has enabled Block Caller ID on the phone number used by your line. To disable call forwarding, dial *73. The free version of Zoho CRM does not support the phone bridge feature and is not supported with this integration. Please contact Zoho for more details. Zoho CRM only allows a single telephony integration at once. If you have had other services linked in the past, make sure to disable these first. 1. Go to my.jive.com/integrations to log in to Integrations Dashboard. 2. Click on Zoho CRM in the left sidebar. You will then be redirected to Zoho CRM to login and allow Jive to access your account. 4. From the Settings tab, choose your line. Note: If you’re an system admin, click [DISABLE INTEGRATION] from the Admin tab to disable the integration for your organization. For all incoming calls to the line and device you selected within Jive Web, Zoho CRM performs a search for customers that match the caller ID. If there is a match, the customer’s information will display within the incoming call notification in the lower-right of Zoho CRM. If there is no match, only the phone number will display and you can click [+] to add the contact to Zoho CRM. All incoming calls from customers are automatically logged as closed activities. To properly integrate with Zoho CRM, all outgoing calls must be initiated from the line and device you selected within Jive Web. When you make a call, Zoho CRM performs a search for customers that match the number you dialed. If there is a match, the customer’s information will display within the outgoing call notification in the lower-right of Zoho CRM. If there is no match, only the phone number will display and you can click [+] to add the contact to Zoho CRM. All outgoing calls to customers are automatically logged as closed activities. Click the phone icon next to a contact in Zoho CRM to initiate a call to them. The call is then sent to the line and device you selected within Jive Web, waits for you to pick it up, and then finally completes the call to the outbound number. During or after a call, you can add notes and create follow-up tasks right from the call notification popup in Zoho CRM. Click [Save] when you are done. 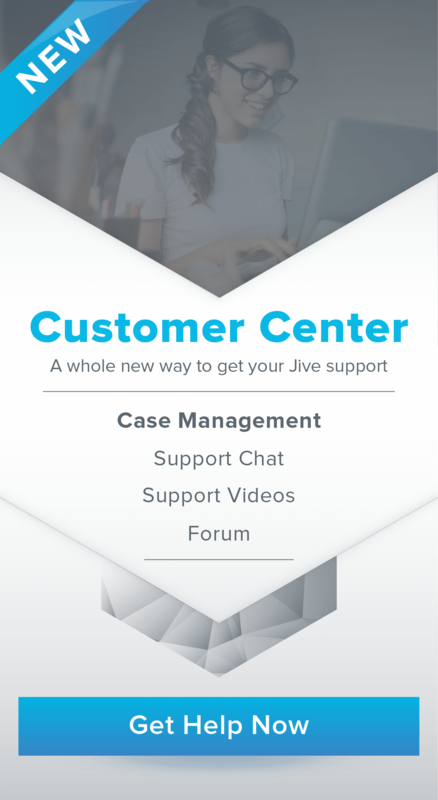 Learn more about Jive Web. The free version of Zoho Desk does not support the phone bridge feature and is not supported with this integration. Please contact Zoho for more details. Zoho Desk only allows a single telephony integration at once. If you have had other services linked in the past, make sure to disable these first. 2. Click on Zoho Desk in the left sidebar. You will then be redirected to Zoho Desk to login and allow Jive to access your account. For all incoming calls to your selected Jive device, Zoho Desk performs a search for customers that match the caller ID. If there is a match, the customer’s information will display within the incoming call notification within Zoho Desk (lower right). If there is no match, only the phone number will display and you can click [Add Contact] to add the contact to Zoho Desk. To properly integrate with Zoho Desk, all outgoing calls must be initiated from your selected Jive device. The call will then be displayed within Zoho Desk (lower right) allowing you to log the call and take notes. If there is no match, only the phone number will display and you can click [Add Contact] to add the contact to Zoho Desk. During or after a call, you can add notes and create follow-up tasks. Click [Add Ticket] to create a ticket in Zoho Desk.